Let the turtles and fish amuse you in the pond or sit back in front of the fireplace and relax. 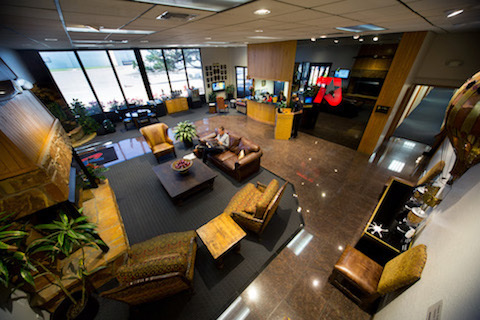 Texas Jet’s elegant lobby overlooks aircraft arriving and departing from our main ramp. Hungry before or after your flight? 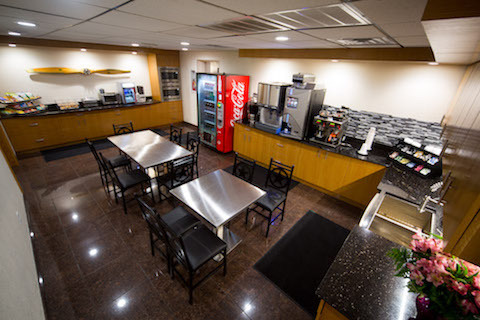 Enjoy a hot bagel, a delicious snack or a variety of gourmet coffee drinks in REFUEL ! 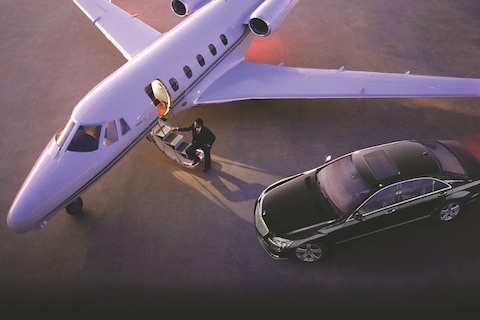 GO Rentals’ planeside carcierge will bring your vehicle right up to the door of your aircraft! GO is very conveniently located in our lobby and is happy to close your contract and print a receipt in just a couple of minutes! Texas Jet is also happy to provide Hertz or Enterprise. LIFT will keep you in shape! Enjoy a good workout in LIFT, our complete Fitness Center. Finish with a refreshing shower. Towels and toiletries are furnished. 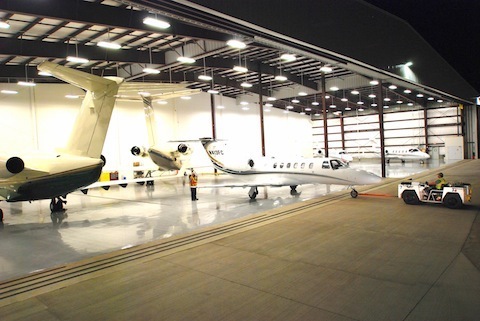 Texas Jet operates 23 hangars totaling more than 450,000 square feet and housing the aircraft of Fort Worth’s top companies. Parking space is always available on our huge, concrete ramp. Hangar space for transient aircraft is normally available. 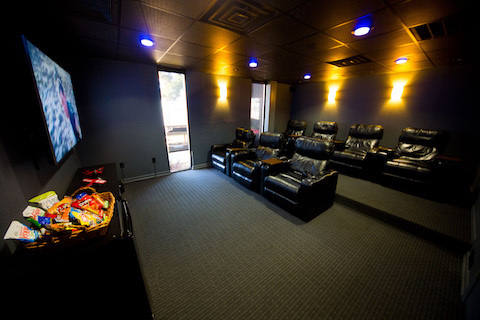 Our big screen, HDTV, Surround Sound theater in Cinema is guaranteed to entertain you. Or settle back in one of our recliners and read or just take it easy. Get the rest you need! 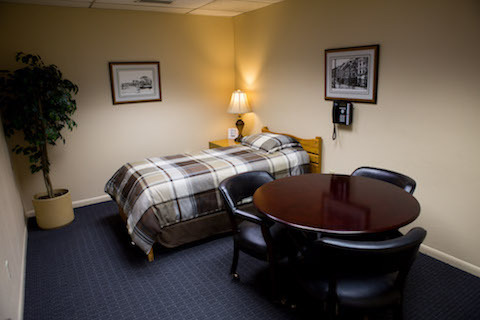 You’ll feel refreshed and ready to go after a well-deserved nap or after relaxing and watching Satellite TV on the flat screen in our Quiet Room. 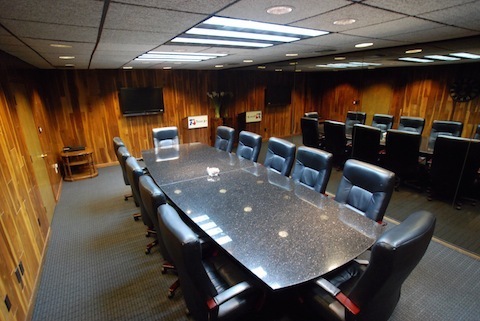 This is also a great room for small meetings for two or three people. 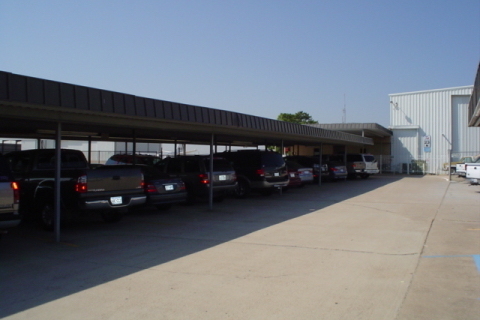 Texas Jet’s covered parking will keep the scorching Texas sun off of your vehicle. Allow us to valet park you, also. Your flight planning will be a snap with WSI, Meteorlogix and a direct radio to Clearance Delivery at your fingertips. 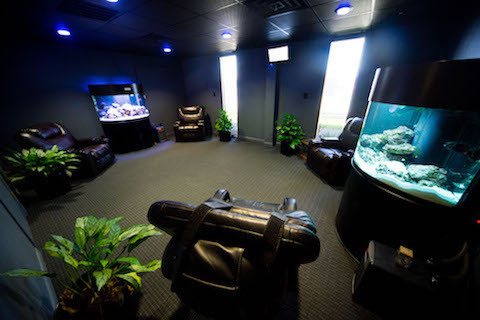 If you really want to relax and let your stress melt away, spend some time in Oasis. You’ll be glad you did. The colors in the reef tank are stunning and the predator tank’s inhabitants are daunting. It’s great fun to watch the Koi and the turtle play under the waterfall. Why travel off-site for that meeting? Our tastefully appointed Texas Room seats 14 and is available for your use by calling one of our Customer Service Specialists at 800-776-4547. We can arrange for catering, too. A projector and screen are available. Need to catch up on paperwork? Our Fort Worth Room seats six around the table and has all the amenities you’ll need including high-speed internet access.